BMRCL Civil Engineer Vacancy Recruitment/Exam-2017: Bangalore Metro Rail Corporation ltd invites applications for the recruitment of Graduate Engineers jobs. Candidates who are qualified B.E or B.Tech in Civil Engineering they are only eligible for applying this BMRCL Civil Engineer Jobs. Online applications only accepted for this BMRCL Graduate Civil Engineer jobs through BMRC.co.in website. This BMRCL Civil Engineer jobs are contract basis only. Total 80 Civil Engineer vacancies are in this BMRCL Recruitment Exam 2017 Notification. Candidates who knows the Kannada Language reading, speaking and writing they are only eligible for applying this BMRCL Civil Engineer Jobs. 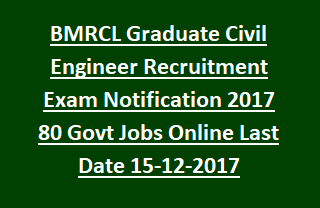 Candidates will be selected through written exam for these Graduate Civil Engineer jobs of BMRCL. These vacancies are for the Project wing of BMRCL. Complete information about this Civil Engineer vacancy of Bangalore Metro Rail Corporation ltd is given below. Upper age limit for this Graduate Civil Engineer jobs is 35 years. Age relaxations are applicable as per the norms of BMRCL. Candidate must have qualified Civil Engineering Degree from any recognized university. And candidate must have known reading and writing of Kannada language. Candidates will be selected through based on their marks in written test. A merit list will be prepared based on marks secured in written exam which is conducted by BMRCL. Written Exam will be objective type only and covers the topics of Kannada Language, General studies, General English and Civil Engineering concepts. Sometimes exam will be conducted only in Engineering subject. Syllabus for Civil engineering will be Degree level and for other topics SSLC level. Interested and eligible candidates may apply online through BMRCL website @bmrc.co.in on or before 15-12-2017. Apply only if you know Kannada language thoroughly. Merit list, admit card, written exam date and other details will be given in the same website.